NARA T625. 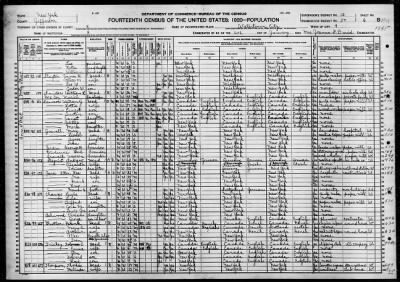 Fourteenth Census of the United States, 1920 population schedules. The 1920 census records each person whose "place of abode" was with a particular family as of January 1, 1920. Data for each person includes citizenship, education, occupation, and birthplace and native tongue of the person and his or her parents. If foreign-born it details the year of immigration to the U.S., whether they are naturalized and, if so, the year they were naturalized.